Go Metro Redesigning Metro’s riding experience for visitors and new riders to LA. 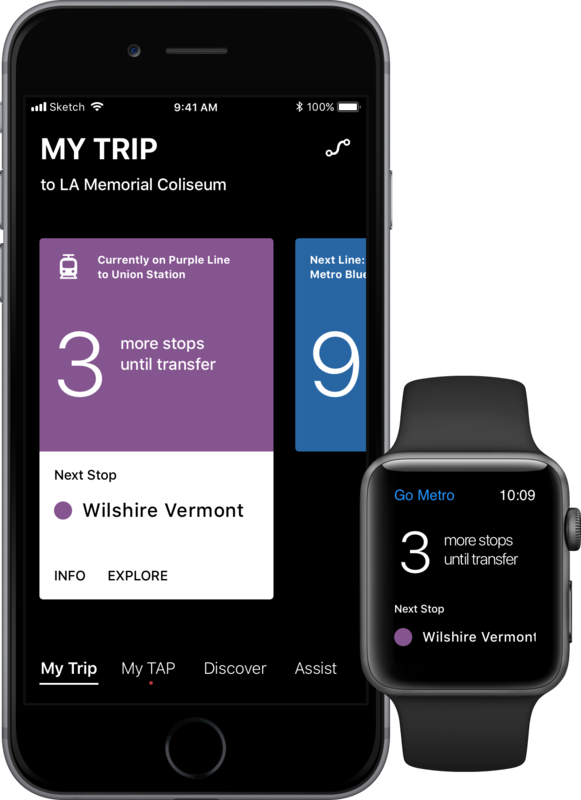 Go Metro app for native and foreign riders riding LA Metro for the first time 12 Week – Capstone Project Go Metro is LA Metro’s mobile app, aimed at making it easier for riders to see schedules and refilling transport fare (in the form of TAP cards). However, it is riddled with clunky interactions and hard to understand language. Incorporating exploration, ubiquitous navigation, and natural assistance, Go Metro makes riding Metro more accessible and stress free for riders, especially those visiting for the 2028 Olympics in LA. Los Angeles will be hosting the 2028 Summer Olympics Game Los Angeles has been chosen to host the 2028 summer Olympics! With the influx of visitors around the world, LA Metro must make its services inclusive and accessible to both native and foreign riders. However, Metro’s TAP and riding experience is not user friendly or accessible. Having slow update cycles and confusing platform designs, riding the Metro rail or bus is a stressful experience for anyone, Angelino or not, trying to navigate the city. On Site / In Person Interview I talked to 6 different Metro riders, spanning across different nationalities, technological literacies, and familiarity with Metro. This allows me to uncover pain points across a diverse user group. "I have a hard time understanding what an EZ pass is. I remember buying that by accident." Prototyping / User Testing I created interactive prototypes and showed it to my users, gathering feedback and validating features. I take these data points to construct the final concept proposal. Current Metro services are hard to use for first time riders and visitors Due to inaccessible language, riders, especially for new or visiting riders, develop “rider anxiety,” the state in which they must be fully attentive during rides to make sure they do not miss their stops. The short amount of time afforded to new riders requires them to constantly be in the state of alert to make sure they get to their desired destination. Complex wording and lack of translations through Metro makes riding stressful for new users Metro’s passes, touch points, and displays are worded in a way that riders, both native and foreign, have a hard time understanding. This ranges from convoluted wording (confusing terms to describe rides or transfers) to lack of language options (only supporting English and Spanish for their TAP kiosks, English for their signage, and 6 other languages on Metro website). Above is a screenshot of the current interface on TAP dispensing kiosks. Users are required to go physically to a machine in order to purchase fare for Metro services. Concepts like EZ Pass, senior pass, day pass, or one way ride are confusing jargon that new riders are not familiar with. Furthermore, current TAP machines only feature English and Spanish translations, making it difficult for foreign riders to understand. The lack of reminders, alerts, or nudges cause "rider's anxiety" for first time Metro users heading to foreign destinations Currently, riders are reminded to exit the train based on announcement from the conductor. However, for a visitor whose primary language is not English, these reminders are not enough to direct and remind riders of their destinations. This means that riders must constantly be vigilant during their transport to keep track of where they are, and when they need to prepare to exit the train. Above is an image of the Firestone station taken by HanSang Yoon. Since new riders have no way of reminding themselves when do get off, they must constantly look out the train window and try to read the small signs on the platform to decide whether to exit the train or not. Should they exit on the wrong station, new riders would need to resituate themselves and wait for the next train. Hard to reach assistance, coupled with language barrier, adds to the stress of riding Metro for the first time It's hard to find assistance throughout Metro. Officials are only available at transfer centers like Metro Center or Union Station. Otherwise, help is only availabe in print form or on TAP kiosks in smaller stations. For visitors, this lack of available assistance makes missing stops dreadful. On the current Go Metro app, riders can only call Metro Authorities for assistance. Currently, Go Metro app affords riders a quick hotline to access help or contact officials. However, this is hidden in their interface, and still operates on the assumption that visitors will be able to clearly communicate in English or Spanish. If riders do not have the app, they must rely on brochures and maps to answer their questions. From finding transfer stations to knowing which side of the platform to wait, riders find it difficult navigating within stations Metro stations are complex, with different levels and platforms leading to different rail lines. This makes navigating to platforms or transfer points difficult. Users rely on signage and mapping to board their rides. For new riders, this can be especially difficult, especially for more complex stations like Metro Center / 7th Street and Union station. Above is an image of Metro Center / 7th Street station taken by Antony. To transfer from Purple line to Blue line, riders must go up one level, tap out of Purple line station, walk through the main mezzanine, tap into Blue platform, and wait on the respective side to board the Blue line train. This series of steps is extremely confusing for the uninitiated, and make transferring under time constraints extremely stressful. How might we help foreign riders navigate through the complex city of LA and get to their destinations easily with Metro? The city of Los Angeles will become more and more diverse in the future, especially with events such as the 2028 Olympics. However, the current system is catered towards native riders, neglecting the needs of visitors and foreign riders. The goal of the project became to create a service that can help a visitor, someone who has never set foot in LA and do not speak English as a primary language, navigate through LA’s complexities. If I can successfully design for this extreme user, I am able to reach others whom Metro serves. For helping people navigate in station, what if Metro provides a guided tour that helps people get to target platforms? With the help of Google Indoor view and AR overlay, users can access contextualized directions, as well as other relevant information. For alerting and nudging riders, what if Metro gives you actions based on your situation. In this sketch, Metro reroutes you onto the right track. When you are almost at your destination, it alerts you through notifications. When you are at location, it provides tips on walking to the venue. 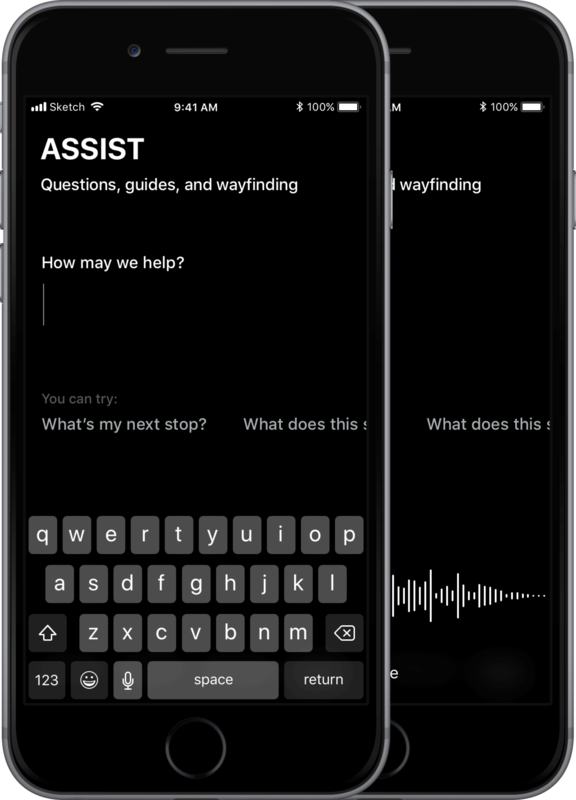 From talking to my users, many pointed out tools such as Google or Deebot that uses voice / type command for help. In this iteration, what if Metro provides on demand assistance through natural inputs such as texting or speech? This feature would not only give users help anytime they wish, but also affords help input in different languages. In station wayfinding, exit alert, and natural assistant are valuable to infrequent riders I composited the concepts and created a tap through prototype. I showed the prototype to 5 of the 6 users I interviewed with initially. I recieved positive feedback on the concepts. 4 of the 5 users liked the idea of nudges and alerts, as it allows them to relax through their trip. 4 of the 5 users also found navigation in station useful. When riders are in trainsit, Go Metro is able to recognize what train is boarded and where it is currently. This is communicated through the progress bar as well as the equipment callout. Directionality would only show up if user preemptively inputted a destination through the app. Many of my users mentioned that using voice command, especially in public, is something they are not familiar / comfortable with. With poor experiences like Siri, many much prefer direct text input as opposed to solely relying on voice commands. Based on feedback from my users, it's much easier searching through event names or addresses instead of stations (since many are not familiar with the names of most Metro stops). In this iteration, users can plan or search a destination using event names such as Olympics race or flower parade on Main Street. See current rail, upcoming rail, and number of stops left Go Metro shows you what line you are currently boarded so you know whether you are on the right train or not. If you have a planned destination, it can display transfer lines as well as how many stops you have left. View trip progress through itinerary views Tapping on individual train cards opens an itinerary view that shows you upcoming stops and current train location. You can also see upcoming transfer or walking instructions when exiting the train, as well as what time you will arrive at your stops. Step by step 3D navigation guide to your platform or transfer point Metro stations are confusing, but with Go Metro you can now see a step by step 3D guide to your next stop or platform. On screen, you can also see when you next transfer or train is arriving, as well as which side the platform to board. Introducing virtual TAP cards for easy purchase Go Metro makes it easy for you to purchase TAP fare. Connected to your debit / credit card, Apple Pay, Google Wallet, and other virtual cards, you can now buy fare wherever, whenever. You also can ask the app about different purchasing programs and incentives. To tap in, simple hold your phone over the turnstyle to enter the stations. Explore LA with the power and conveniance of Metro Discover gives you access to gems and interesting places in LA using Metro as a primary transportation method. You can see beatiful art museums, attend events, or enjoy delicious food, all using simple Metro trips. Access help through natural language and text input You can now ask Go Metro any question you might have, from when your next train is arriving to what a sign means. You can also give it commands such as directing to a destination or buying / refilling a TAP card. With Go Metro, you don’t have to hunt down a Metro official to get the answers you need. Intelligent suggestions and answers to your commands With Diagflow, Go Metro can now give you actionable steps when you give a command or ask a question. For example, if you tell Go Metro to take you to a destination, it would provide you with alternative routes to consider. If you ask it a question such as alerting you when to get off, it would give you different reminder options. 11 different languages available for riders around the world Go Metro comes pre-packaged with 11 different language translations. This makes the app accessible to different visiting riders, making sure that anyone can fully utilize Metro and enjoy the city of Angels during their stay. Conduct usability study and explore wearable interface With the interactive prototype, I will be conducting a second round of testing with previous users, this time focusing on usability. Additionally, in the future, wearable interfaces will become more ubiquitous and common. With that in mind, I will prioritize features from the mobile app that would be suitable for wearable devices.